Seashell crafts are becoming increasingly popular and make excellent bathroom decor or beautiful decorations for your beach home. The mosaic technique for this seashell wreath project sets it apart from many other sea shell wreath ideas. Try something different! Wreath, 12" x 2 1/4" x 2"
Wrap plates and tiles, one at a time, in old towel. Place towel on hard surface, like concrete sidewalk, and rap contents smartly with hammer. Do not hammer repeatedly or you risk disintegrating mosaic pieces. Check inside of towel periodically and remove pieces of desired size; wear work gloves at all times when handling broken items. Be sure to remove all shards from towel or discard towel entirely to prevent accidental cuts. Use glue gun to secure mosaic pieces, including leaves, to foam wreath in pleasing design. Use tile knippers to cut some pieces to size as needed. Fill in open spaces with shells or other interesting items. For large shells, use serrated knife to hollow out spaces in wreath so shells sit firmly, as in center opening. Refer to photograph as placement guide. Follow manufacturer's directions to mix spackling "grout" in disposable container until smooth and spreadable. Add a drop or two of acrylic paint to tint grout slightly. 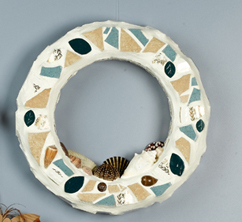 Apply grout to inner edges of wreath using spatula; be sure to push grout into spaces between mosaic pieces. Use flat paintbrush to spread grout around shells. Smooth grout as much as possible as you work. Let set a few minutes, then gently smooth using damp sponge. Rinse sponge often in fresh water. Use wet paintbrush to remove excess grout from shells and tight spaces. Use spatula to work grout into spaces between mosaic pieces on outside edges and front of wreath. Use damp sponge to wipe away excess grout and to smooth edges. Let grout set up slightly, then wipe face of mosaic pieces again with damp sponge. Let dry completely. Use clean, soft rag to polish mosaic pieces. Use wire cutters to cut 12" length from coat hanger. Fold wire in half and twist ends together, creating small loop at each end. Use pencil to poke two small holes in top center back of wreath and glue wire ends into holes. Dip straight pins in glue and insert into foam on angle through wire loops.